Emotions are the feminine component of our being. They are the Yin (magnetic, receptive, passive) energy within us. We receive them as internal signals instructing our behavior, generally promoting those things we find favorable and opposing those we don’t . As an unconscious response to stimuli in our environment, they serve as a real-time guidance system–the compass from which we receive direction in life. However, as with any tool, when they are not understood or properly used they can be destructive to ourselves and others. People who are disconnected from their emotions can easily become domineering, manipulative, or sociopathic . Conversely, those who are connected to their emotions but who lack control of them can easily become dominated, manipulated, or victim to the ebb and flow of their feelings . To use our emotional compass wisely, we must wed our feelings to our intellect. It is important to remember that emotions are always responses to thoughts/beliefs/definitions we hold about circumstances. Whether we are conscious or unconscious of the thoughts/beliefs/definitions does not matter. So, it is wise to become aware of and guide this often subtle dialogue within to use our emotions to their utmost potential. And what potential they have! Emotions are the very fuel that add power to our thoughts/beliefs/definitions and turn them into inspired action. emotional-awareness – Specifically identify the feelings that you are having. Don’t settle for “I feel bad” or “I feel good.” What are you feeling specifically? thought discovery – What thoughts are the source of the feeling you are having? If the emotional response is negative, what core belief/s do you hold that allowed these thoughts to arise? transmutation – re-frame the circumstances and replace the limiting beliefs into a more positive orientation that leaves you feeling more empowered. motivation – use your new emotional intelligence to add power to your actions and to support those around you through empathy. It is important to remember that emotions must be felt. Theoretical models can help us better understand them, but true emotional intelligence comes from first intimately experiencing them. This surrendering to the sensation of our emotions is what gives us the capacity to have emotional intelligence at all, and it is common for people to suppress or bypass them out of self protection. It is also important to remember that all emotions are useful. 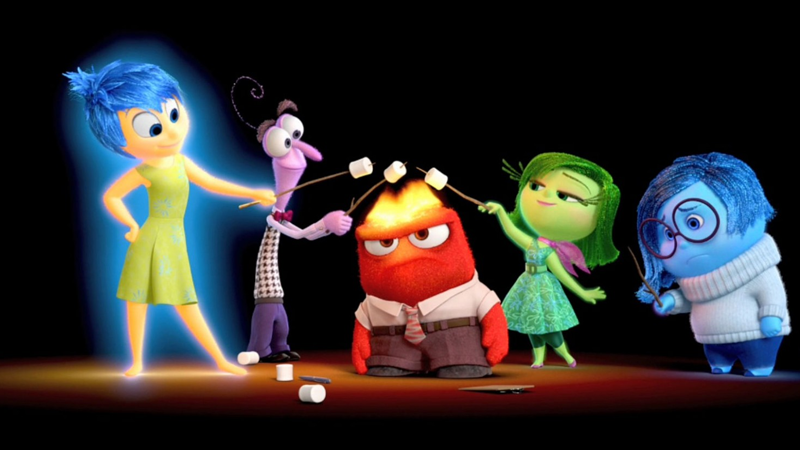 Anger, fear, sadness, and disgust are just as useful to us as appreciation, hope, and joy . Fear prevents us from making decisions that carry excessive risk. Anger inspires us to change things that are no longer serving us. Problems only arise when we allow our unpleasant emotions to dominate our experience. 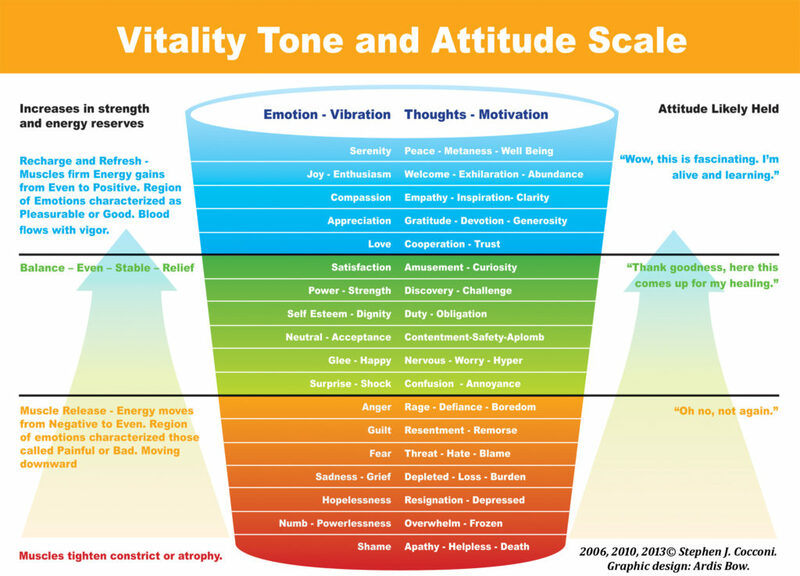 The diagram to the left (click to view larger) gives a reasonable diagram of the emotional scale that you have to work with and how the different emotions influence your physiology. It may also be helpful to understand why we feel different emotions. Each of the fundamental emotions arises from a particular interpretation of events. Confidence is the belief in your worthiness. Joy arises from the present-moment appreciation of what you desire. Excitement is the anticipation of what you desire likely happening. Hope is also the anticipation of what you desire likely happening, but implies a potential that it may not happen. Fear is the belief in the anticipation of what you do not desire likely happening or the likelihood of losing something highly valued. Sadness arises from the belief that you already have lost something highly valued. Frustration or anger arises when you feel something is unfair or unjust. Shame is the belief in your unworthiness. Again, negative emotions like anger, guilt, and shame are very useful. Use them as the tools they are. They are cues that let you know something needs to change for improvement in your life. Become aware of them, and then transmute them into feelings empowered by more positive thoughts that then yield inspired action. That is really the only control you have in life. So when becoming aware of these emotional states, ask yourself: what do I value that is being threatened that is prompting my fear? What do I feel I have lost that is prompting my sorrow? What do I think is unfair that is inspiring anger in me? And most importantly, how can I see this situation differently? The emotional traumas that people often experience as children in an attempt to comply with the demands of their parents and immediate social environment to gain approval and acceptance is usually dormant deep within their psyche. Despite not being consciously aware of these painful emotional memories, they are a key governing force in a person’s life. We interpret the life experiences we have through the lens of our beliefs and emotional states. We then think, act, and manifest a set of conditions around us (relationships, career, health, etc.) that are in harmony with what we most strongly feel to be true. So if you would like improvement in the quality of your life experience, and as a result, the conditions that surround you, it is imperative that you begin doing the inner work of reacquainting with those strongest beliefs and feelings you hold. This can often be an uncomfortable process that causes you to face suppressed emotions from childhood or a traumatic event, but it is necessary. Jung referred to this process as one of individuation. This is the process that allows an individual to discard the mental programming that they adopted to survive in the world as a child, and construct a new paradigm that is in full harmony with their true authentic desires and expression as a person. This is the magnum opus, or great work, that has been shared through esoteric traditions throughout history. It was referred to as Alchemy in the middle ages and has evolved into the discipline of psychology today. Where is the greatest discord in your life? What emotions and beliefs are at the foundation of this part of your life that may not be serving your highest expression and fulfillment? To healthily blossom into the unique individual you choose to be requires that you learn how to effectively communicate with others. Please watch the following video of Jef Gazley discuss how to communicate assertively here. The key distinction between the 3 communication styles [aggressive/assertive/passive] is your level of consideration of all people involved. Those with an aggressive style care excessively about their needs and deficiently for those of others involved. Those that are passive care excessively about others needs and deficiently for their own. Assertiveness is the most mature communication style as it is characterized by caring deeply for the needs of all involved, leading to win-win solutions when faced with challenges. Emotions are discussed regularly in terms of positive and negative without a full disclosure of what those terms mean. The root word of positive is posit. Posit means “to assert,” coming from the Latin word positus, meaning “placed, situated, standing, planted.” Therefore, something that is positive is something that asserts your unique expression of divinity or is planted firmly in the truth of who you are. Similarly, a positive reaction to a situation is one that likewise asserts your unique expression. This positivity yields expression, joy, excitement, and passion. The root word of negative is negate, which comes from the Latin negare, meaning to “deny, say no.” Therefore, something that is negative is something that denies your unique expression of divinity. The negation of expression is depression. Thus, prolonged negativity yields depression, fear, and apathy as it’s emotional manifestation. When one lives in harmony with their divine expression they feel excitement, joy, and find their place as a harmonious note within the grand symphony that is the cosmos. The irony is that most people seek harmony in life by choosing a persona, often at odds with their true expression, to fit within social norms and incessantly attempting to control their life conditions. To actually create harmony, one must simply be who they are in a state of openness and authentic expression. From this authentic state of being, the right conditions to support us and our intentions will naturally arise. This may seem confusing, so lets look at some examples of how this works. On an individual basis, we have become well accustomed to the notion of flow in an athlete or artist’s work. Such practitioners often describe being in a state of openness and receiving in which a performance works through them as if they were a conduit through which a higher will was acting. Their cognitive, emotive, intuitive, and physical faculties were effortlessly engaged and integrated to produce the most harmonious results from this state of openness and authenticity.